Without a doubt, we want to believe that no one we employ could be capable of stealing or that they would sue us if they slipped and fell on site. Running a business is a challenging endeavor. Before opening your doors you will have signed numerous documents, obtained accounting advice, and dealt with multiple contractors. After all of these items are completed, it’s time to think about electronic or physical security measures. A surveillance system from Safe Systems will not only limit loss and liability to your business but also increase productivity and profitability. In fact, it might be the single most important factor in maintaining the efficiency of your business. Retail workers rank no. 1 in the world for employee theft. 75% of restaurants’ inventory losses are due to employee theft. Management and administration errors account for around 26% of retail loss. Employee theft and embezzlement results in one-third of all small-business failures. A single slip and fall, harassment, property damage, or personal safety claim could cripple your business. 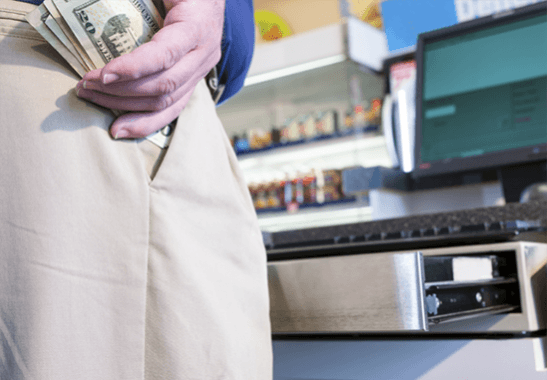 Deploy a visible deterrent to customers and employees who might be thinking about engaging in theft. Strategically placed cameras will discourage most would-be criminals. Detect and document when an event occurs, using a Digital Video Recorder (DVR). Take advantage of advanced tools such as video verification or video analytics to provide better data to the authorities and encourage faster response in an emergency. Police place a higher sense of urgency on alarms that have verification of a possible threat on site. Use video footage of security events as an employee training and accountability tool. You can use real examples to curb poor decision making and violation of safety procedures within the workplace. Related: Which security camera fits your business? The last and final piece of the puzzle is determining what action needs to be taken when an event occurs. In most cases, employee theft security situations are not life-threatening, and the police are not dispatched, so the information collected (such as video clips or still captures) serve as documentation for further action by you, the employer. The key takeaway is that those who open their doors to the public and hire people will have a great deal to worry about. Your business requires an added layer of security and information to be successful. With data that is often available in real-time, you can make key decisions and protect your bottom line. We have found that more often than not, a good system will pay dividends in reducing costly threats to your operation. Safe Systems would like to be your security partner in this endeavor. Call 1.800.446.7519 to speak with a Safe-Systems consultant who can help you choose the right solution for your property and budget.